It's summertime ... at least if you're in the Northern Hemisphere & if you're not then happy winter! With the start of June comes all new challenges, kits & fun over at Stuff to Scrap so let's check it out. As always there are a lot of ways to become part of the STS family besides being an active scrapper & forum member! Right now we are looking to fill two positions, the STS Newsletter Editor & the STS Advertiser. Both positions will be open until filled & you can check out the details below; if interested please email support [at] stufftoscrap [dot] com, we'd love to hear from you. And remember to keep an eye on the CT & Designer Darling Calls section of the forum for other positions, they pop up all the time. All the new challenges for June are posted & make sure to get the June speed scraps on your calendar to keep up with your scrapping during these busy months. Several of the new STS Designer Darlings are hosting this month & the speed scraps are a great way to meet these wonderful ladies. June is also the start of Season 4 of the This Scrapper's Got Talent Contest! Think you have what it takes to be the next Top Scrapper here at STS? Come join in some friendly competition and get ready to scrap, scrap, scrap! To see the contest details & sign up, please head to the TSGT 2013 Sign Ups thread; participation is only open to the first 100 people to sign up by Saturday, June 15th. Of course the start of a new month brings new products to the store. First up is the June Mega Designer Collaboration, Capture Life, a kit that's all about capturing those precious little events that happen throughout a person’s life, whatever the occasion. With contributions from 9 designers you not only get a great kit but a great sampling of the various designers' styles. In Capture Life you'll find 81 elements, 36 papers, 2 alphas & 2 templates; just what you'll need to complete the June Mega Kit Challenge. Purchase Capture Life before Friday, June 7th & you'll receive the matching quick page set for free (a coupon will be included in your download). Time and time again the Designer Darlings at Stuff To Scrap create an outstanding monthly commercial use grab bag! This month is no exception, with the Paper Essentials Grab Bag. This paper making themed grab bag contains everything you will need to create an endless supply of papers for your kits, including things like layered paper patterns & paper textures. You won't want to miss this collection of commercial use items, perfect for rounding out your designer stash. Make sure to grab the April 2013 Mega Collaboration, Refresh and Renew, it's matching quick page set & the April 2013 CU Grab Bag, Spring Fling, before they're gone at the end of June! May was the month to celebrate moms & to help you scrap all those wonderful pictures of the leading ladies in your life, the June Build A Kits are here with the theme of Beautiful. You'll find paper packs, elements packs, mini kits & more in this month's collection; purchase 3 or more of the June BAKs in one transaction & use the code JUNEBAK_BUY3_SAVE50% at checkout to save 50% on all the June BAKs in your cart. And after you pick up your June BAKs, head over to the June BAK Challenge to scrap a layout of your favorite lady! 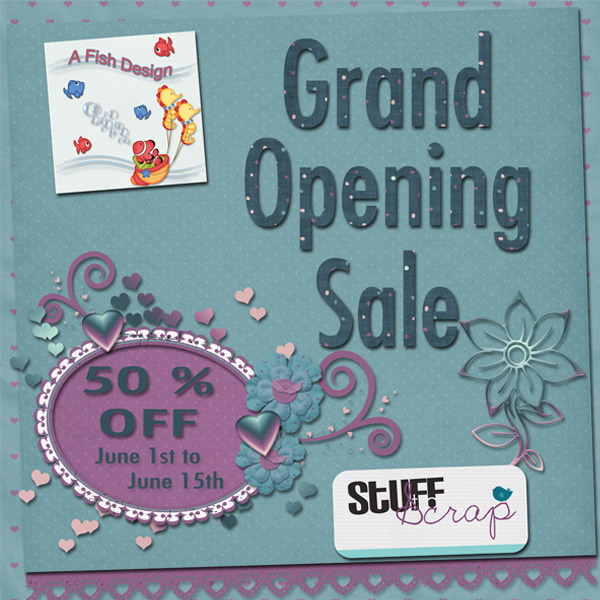 LilyAnn of A Fish Design is holding a Grand Opening Sale until June 15th, pick up anything in her store for 50% off during that time. New sales & specials are always popping up so make sure to check out the Designer & Shop News section of the forum for announcements. The June 2013 Road Trip Starry Summer Night has taken off, you'll find all the stops right here. Make sure to check it out soon because each piece is only required to be available for 2 weeks & you won't want to miss out on any of these great freebies. If you're interested in joining in on the July 2013 Road Trip, you can find all the details in the July 2013 Road Trip thread, we'd love to see you! Thanks for reading and we hope that you have a wonderful start to the summer (or winter)!